Ma’s Madhouse is owned and operated by Mary Ann Griffin. Her unique style is evident – it’s whimsical and creative with a hint of burlesque. Her hairpins and masks are one-of-a-kind, a perfect gift for someone who has totally awesome taste. 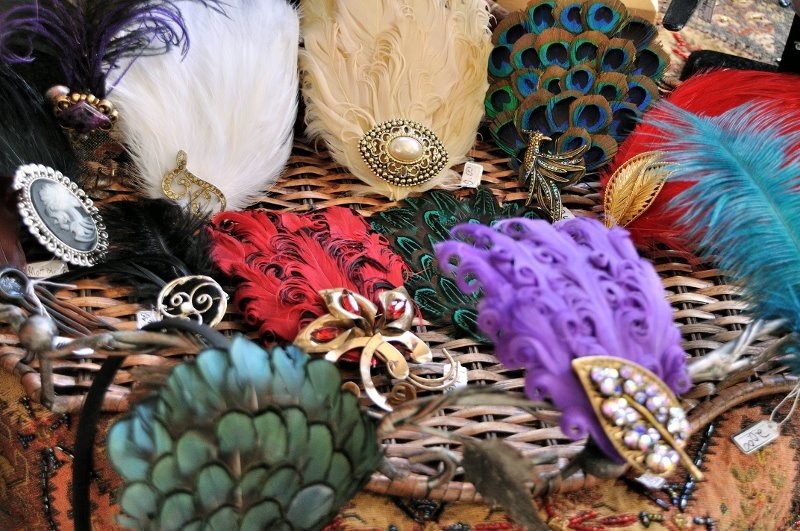 If you love feathers and cameos and affordable, quality jewelry, Ma’s Madhouse is for you. Follow Ma’s Madhouse on Facebook to see where she’ll be next! Like, Share, or Comment on this post on the GrowRVA or South of the James Facebook Page, and you’ll be entered to win your choice of a mask or a necklace from the South of the James Market, so start sharing! We will announce the winner on Facebook at 9pm, Friday Aug 9. The name of my business is MA’s Mad House-unique accessories and custom creations. I sell handmade jewelry including necklaces, rings, hair art, bracelets, brooches and all sorts of custom requests. I use many materials including real feathers ( cruelty free and organically dyed), sterling silver, antiqued bronze, nickel free alloy, pearls, Swarovski crystal, lace, chains, resin, recycled vintage items, stones, and fossils. I also do on site feather hair extensions! One of my most popular items is my feather hair fascinators. These lovely, one of a kind hair pieces range in size from small and dainty to large bold statement pieces. 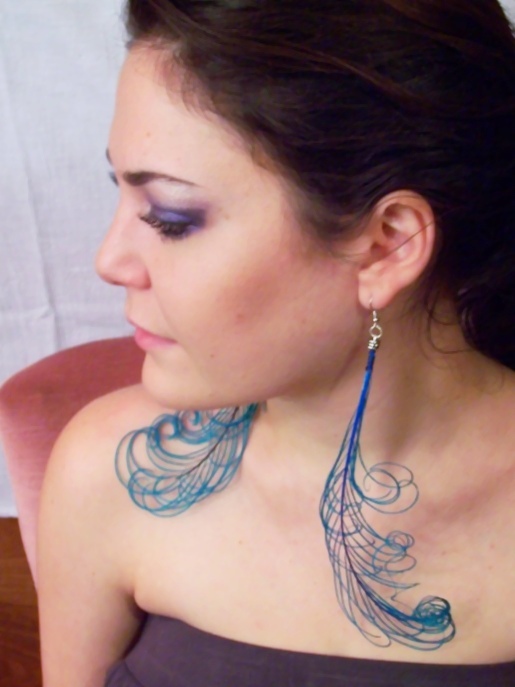 In a huge spectrum of colors and feather types i think they are such a hit because of their classic timeless beauty. Come by my booth and play dress up or request something specific for a certain outfit or party! I started selling handmade accessory items about three years ago. I’ve been making jewelry and wearable art for myself all my life. This is my second year vending with GrowRVA. GrowRVA has been a wonderful partner and advocate in my creative adventure! It might surprise people to learn that I fix jewelry for very reasonable prices as well as welcome custom ideas and requests! I love to manifest people’s creative ideas and needs. This week I have been basket weaving for a wedding flower girl basket custom order. My favorite vendors to trade, barter, and buy from are Crossroads bagels-tasty cream cheese, Alfedo’s bee hive-Alfredo is such a great person I think of him as a market mascot or patriarch of sorts and his honey keeps my seasonal allergies at bay, Old Tavern Clay-beautiful coffee mugs, Montana bread company-crazy delicious nutty bread, Big Daddy’s BBQ-love the chicken salad, Pair-a-Dice farm- I get eggs here every week and they have the best Lamb my mom has ever tasted, Empress farm-their strawberry habanero BBQ sauce is to die for, the Henna Lady- Colleen and her helpers are so talented, and Village Garden- David and Barbara are awesome and their spice grinders are the best! My typical Saturday starts out with music! I plug up my iPad and get the tunes flowing for good mojo. Then I set up my booth to display beautiful things so that u feel like your walking into a treasure trove of lovely sparkly and colorful things to adorn yourself with. After set up I typically work on a project or talk to customers and fellow vendors near by. If I’ve brought a friend to help I will usually get the opportunity to leave them in charge and slip away either toward the beginning or end of the market to grab a bite to eat, a gift, or to say hello to vendor friends. I’m always sad when noon rolls around and frequently wish we had more time! I love creating beautiful things for people and the wonderful social and community vibe of the south of the James market.